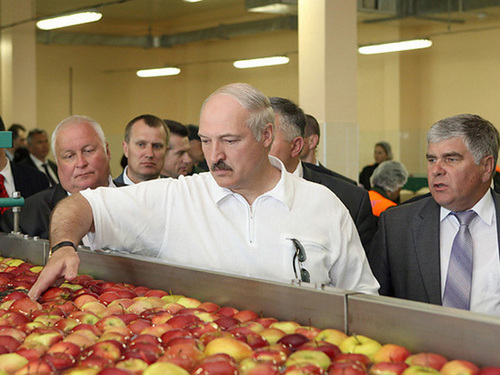 On April 12, the Rosselkhoznadzor ban on the supply of apples and pears to our country from Belarus comes into force. The office once again reminded that food from the neighboring republic does not meet sanitary standards, and sometimes comes without the necessary documents. This decision was clearly a response to the demand from Minsk shortly before this to increase the cost of transit of Russian oil through its territory. Another trade war began between the “Allied” and “fraternal” states. As they say, friendship is friendship, and money apart. There will be no winners in this confrontation – both sides will have to compromise. Moreover, Lukashenko will be the first to take a step forward, since the financial losses from spoiled relations with Russia will turn out to be much more preferences, which he is going to bargain for. Claims to the Belarusian side by Russian officials are substantive. After Moscow imposed a food embargo in 2014, restricting the import of a number of agricultural products from countries that had declared sanctions to Russia, Belarus became the main transit point for the supply of counterfeit food to our country. Minsk tried to take full advantage of the situation and replace the favorite foreign products lost by the Russians with a product bearing the label Made-in-Belarus. It came to the point of absurdity – Belarusian enterprising exporters tried to arrange for the delivery of Spanish “jamon” and German “Dorblu” to Russia. As the Rosselkhoznadzor reported last summer, over the 4 years of the embargo, over 27 thousand tons of products illegally imported into our state were identified: almost 1 thousand tons of animal products and more than 26 thousand tons of plant products. Most of this counterfeit was imported from Belarus and Kazakhstan. According to the Rosselkhoznadzor, in the first week of April alone, almost 40 trailers without phytosanitary documents or with falsified certificates were detained on the Russian-Belarusian border. The losses of Moscow will be less noticeable. Yes, our country remains the world’s largest buyer of fresh apples. According to the Ministry of Agriculture, the level of self-sufficiency with these fruits in our country is no more than 25%. True, the share of Belarusian apples in the Russian market is not as large as it seems – in 2017 it barely reached 3% or 45 thousand tons. On the one hand, fruits from the union republic are much cheaper than from Turkey: a kilogram of Belarusian apples costs a maximum of 2.3 rubles to a wholesale Russian buyer, while the cost of analogues from other states can reach up to 6 rubles. The ban on goods from Belarus may affect the domestic Russian prices for fruits and vegetables in our country, but they clearly will not take off. Especially, given the spring-summer seasonal fall in prices for imported agricultural products. With the supply of Russian oil on the territory of Belarus is somewhat more complicated. An increase in the transit tariff may raise the cost of the Russian side to $ 700 million per year. However, then the question may be put Moscow allocation of new loans to Minsk – the last tranche of $ 600 million was agreed in early April. Minsk needs these funds badly – otherwise it will not be able to refinance previously attracted loans. In turn, it would be strange for Russia to subsidize a country that is trying to squeeze the maximum amount of money out of a partnership, while accusing its closest partner of actually fraud. Therefore, a compromise between Moscow and Minsk is inevitable, it is unlikely that Lukashenko will refuse to allow Russian officials to ruffle their nerves.